Whether they be cats or dogs, pets enrich our lives in a variety of ways. They provide our days with meaning and reinforce our sense of responsibility for another living being. They serve as endless sources of entertainment–from the hilarious way a cat reacts to her catnip toys to how excited a dog gets for another round of fetch at the park. And, most importantly, they provide us with comforting companionship and offer us unconditional love in times of need. It’s no wonder that the loss of a pet can be so difficult. Often, dealing with the grief of loss can be a complex process to navigate. Fortunately, there are various ways to heal. Amidst the feelings of grief, you or someone you love who’s experienced a loss of a pet may sense the need to memorialize the pet in a special way. Some people find solace in donating to the local animal shelter in their pet’s name, or creating a tombstone or urn adorned with the pet’s name. However, imagine celebrating a pet’s memory by seeing their spirit re-created and represented in a beautiful artistic form that evokes special memories from your time together. 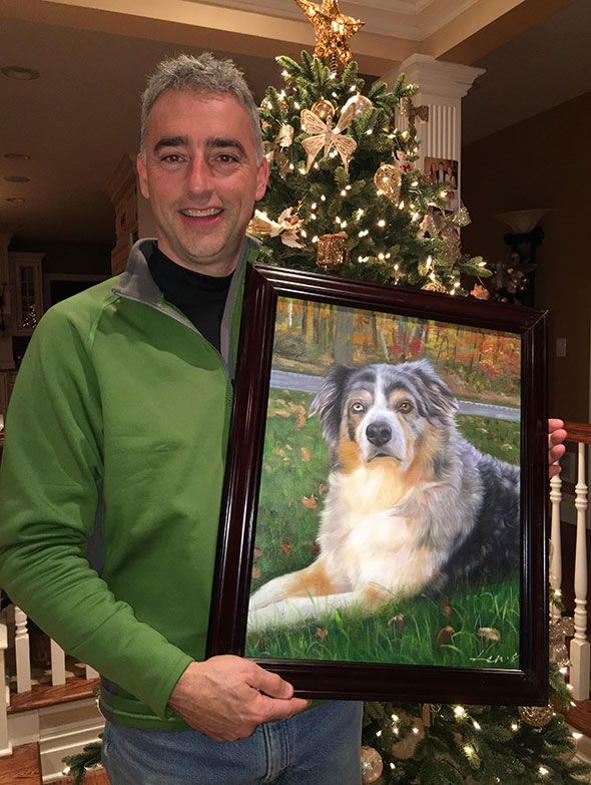 At Paint Your Life, we make it easy to transform photos of dogs, cats, and more into dynamic and meaningful hand-painted memorial portraits. Whether you’ve personally lost a furry loved one, or are seeking the perfect pet memorial gift for a friend or family member who has, our custom portraits enable fond remembrance of the departed pet in a creative manner. However, don’t simply take it from us. This customer couldn’t have said it better–a custom hand-painted portrait can often be a step up from a photo. In addition to commemorating the pet, it’s an art piece that will add to the creative decor of your or a loved one’s home. Our talented and professional artists work hard to thoughtfully capture the unique details that made a pet exactly who he or she was. Nancy’s idea to have a photoshoot with her dying dog was a wise and thoughtful step in her healing process. But taking the photos a step further and transforming one into a portrait added an additional layer of creative remembrance of her dog Dusty. 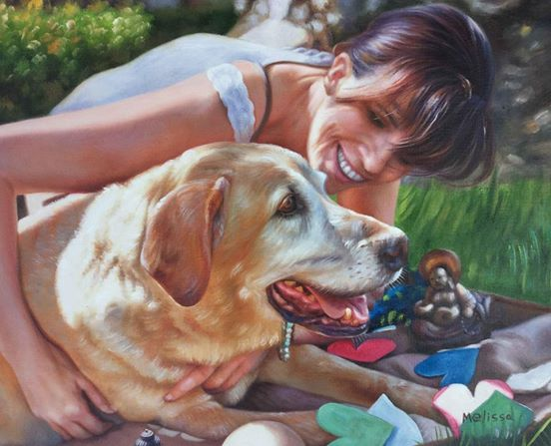 If you have a friend or family member who’s recently lost a dog, a portrait like Nancy’s can be a perfect dog remembrance gift. 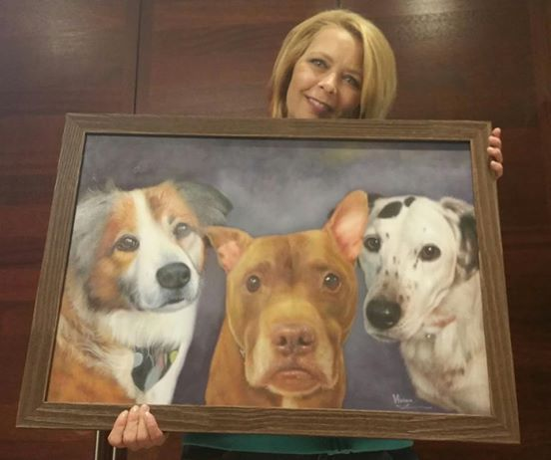 TV host Kathy Ireland had the pleasure of receiving a surprise gift portrait of her and her pets when our founder was featured on ModernLivingTV. Though her pets hadn’t passed away, her sentiments regarding the gift were still heartfelt and appreciative. See her delighted reaction by watching the video above! If you’re searching for a unique way to memorialize a beloved pet or a heartfelt pet remembrance gift for a dear friend or family member, look no further. 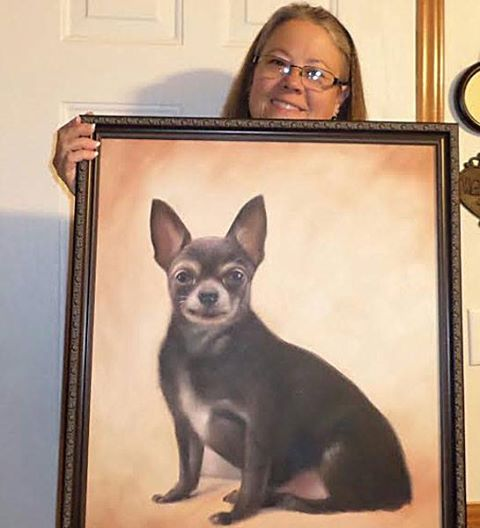 Bring the spirit of your or a loved one’s pet home by commissioning a portrait of them from Paint Your Life. Submit your order for a custom portrait order today!